Britannica School: Providing properly sourced and curated resources. Vivienne Blake, Senior School Librarian from International School Basel tells us about their experience and why they chose Britannica School at their institution. Students would often roam freely on the internet, which resulted in them scattering their “Digital DNA” everywhere, and exposed them to a range of factually speculative information sources. We needed a resource to provide our students in the PYP, MYP and DP with readable, factual, properly sourced articles and curated resources, as well as copyright-paid images, as well as help with citation. Britannica School is a very dependable, organized, well-designed and comprehensive resource. On top of that, Britannica’s customer service is excellent. Our students and teachers now have fast, organised, curated online sources of information, learning tools and resources. We use Britannica in the primary, middle school, and senior school libraries as a starting point to learn more about a range of topics. The graded reading levels make the information more accessible to a wide range of students, many who speak English as a second, third, or fourth language. This is my third international school, and I have been so happy to work with Britannica at each school. I have been using Britannica School for almost twelve years. The products and the customer service set a great standard. 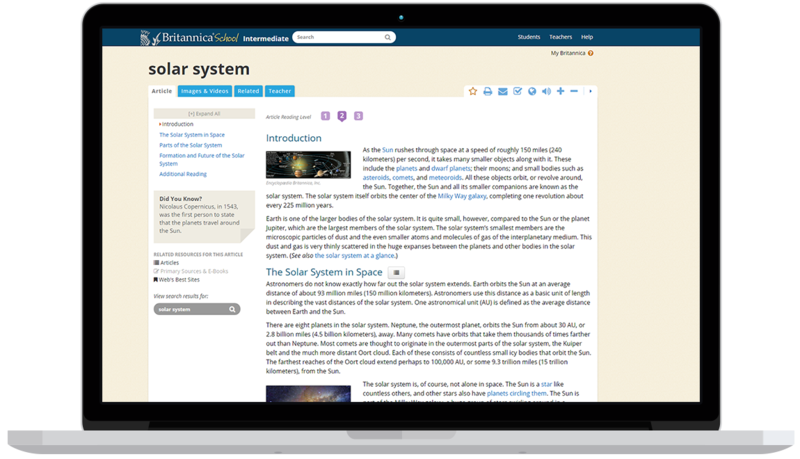 Would you like to try Britannica School, or any of our other products for free in your institution? Just click below and we can arrange a demo and a free trial for you.